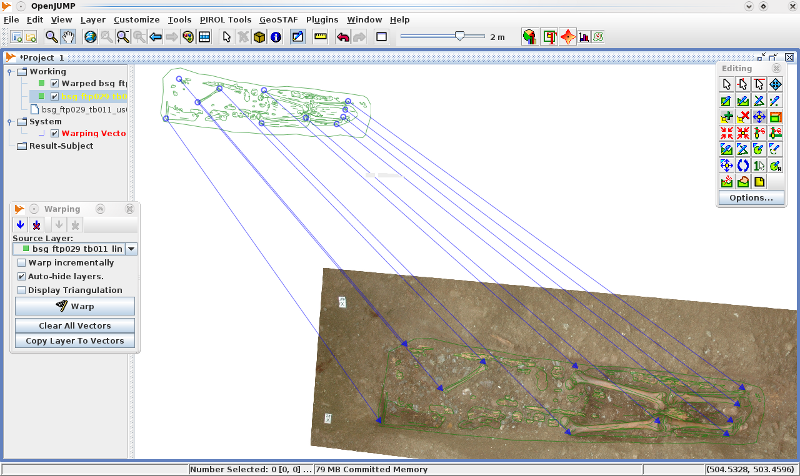 ... but of course there are also many other tools, which sometime are usefull to handle excavation data (below you see the "warping" utility). Moreover the database integration in the program is pretty enought for this kind of small projects. Yesterday evening i was working on an illustration for an archaelological publication. The image reguards an amphora I modeled in Blender, which for many reasons I had to cut in half (and along different sections). I lost a lot of time cutting the amphora with a (very simple) boolean operation inside Blender, but the final result was not good enought (especially considering the wasting of time). 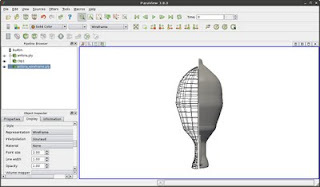 Finally I had the idea to export the amphora from blender and import it in ParaView, to use the simple "Clip" tool inside the very large filter collection of this software. This simple/stupid solution saved me a lot of time, so I complete my work inside ParaView. It is not the first time I have to use both of these software for a project and, like before, I used the .ply format to exchange models from Blender to ParaView and the other way around. 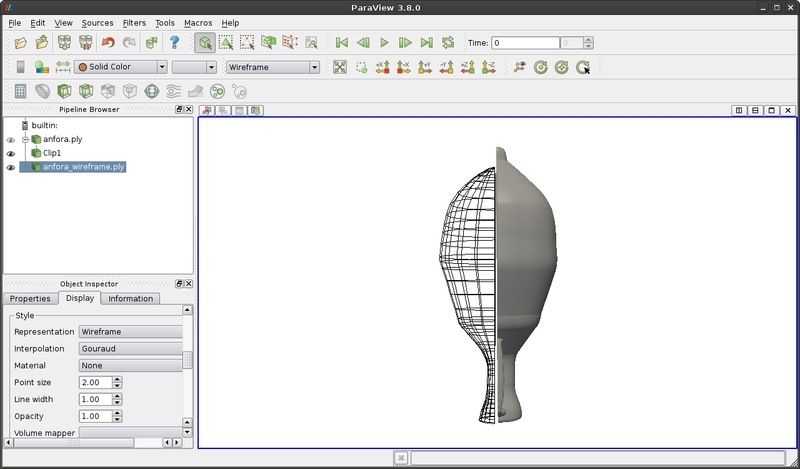 In the image below you can see a screenshot of the amphora in ParaView. Good news from University of Ferrara! 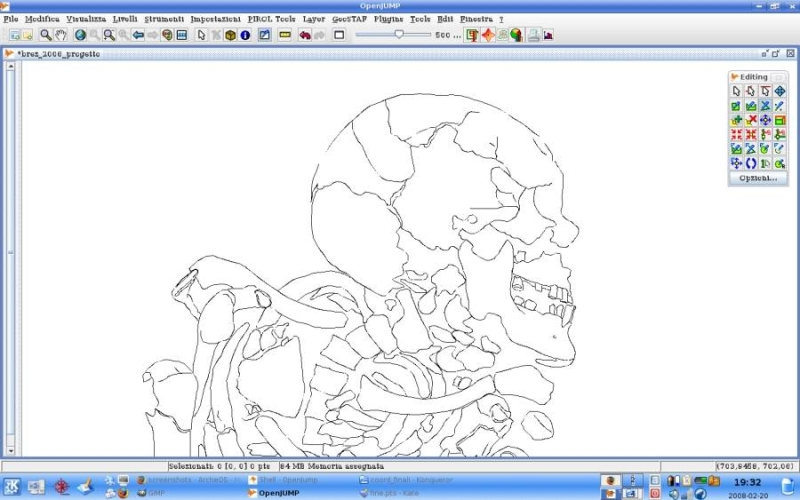 A new workshop about Free/Libre and Open Source Software in archaeology will take place on the 13th – 14th October 2011. More info on the official website. It will be a good oppotunity to meet and exchange experiences and informations. See you there! We tested the implementation written by Nghia Ho and the results are amazing. Data elaboration was effectvively 40% faster. Now we are working on the new package for ArcheOS, wich will be released ASAP. In the image you can see the data we used for the test: the old version of CMVS/PMVS needed 153 minutes, while the new implementation completed the process in just 92 minutes. Untill now, in both cases, it is better to use Bundler 3 instead Bundler 4 (that seems to have some problems with symmetrical objects). Anyway for option 2 there is no need to "erase the background" so it is possible to use also the newest version of the sofware (which is the one inside Python Photogrammetry Toolbox). This is because other objects in the background can help Bundler to find the right position of the cameras for every picture. the image below is an example of this situation: I took the photos walking around the archaeological find, which was simply placed on a piece of wood (over a normal A4 paper, for metric references). The archaeological find in the picture comes from the mission in Khovle Gora (Georgia) of University of Innsbruck, Department of Ancient History and Near Eastern Studies, (Walter Kuntner and Sandra Heinsch) and Javakhishvili Tbilisi State University (Prof. Vakhtang Licheli). In 2006 we joined the Aramus Excavations and Field School. That one was our first year in the project as a society. Our primary goal was to help in software migration from closed source softwares to FLOSS. The migration ended without problems, thanks to ArcheOS, but it caused some minor changes in the archaeological workflow. 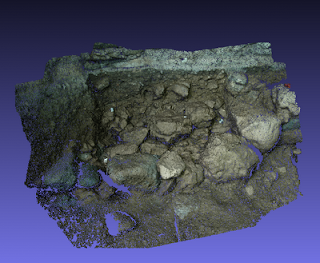 One of most important was the new methodology we had to develop in order to performe a fast photomapping technique of the excavation (at least as fast as the system they used before). 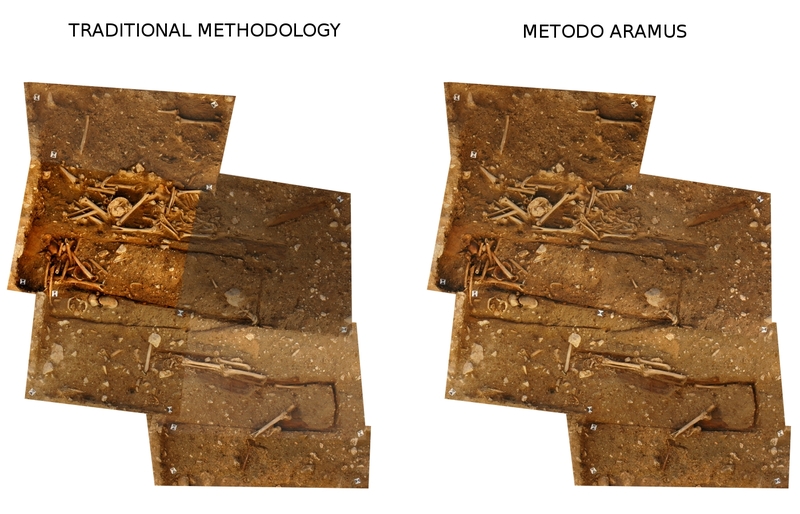 We called this new methodology "metodo Aramus" and, untill now, we are still using it. The main reason is the quality we reached with the georeferenced photomosaics: compared with other traditional techniques, every single photo in the final image is equlized in brighteness and contrast. The result is a composite picture in which is more or less impossible to recognize the borders between the single photos. 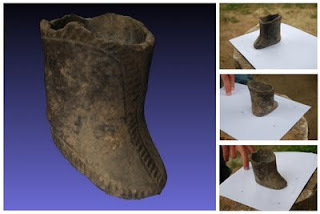 IMHO one of the main benefits of photomapping is the fact that everybody is able to do good archaeological drawing. In this way it is not necessary to divide archaeologists between "diggers" (who simply excavate layer by layer) and "drawers" (who just document). In our (Arc-Team) experience it is never a good solution when someone has to document a situation he does not know (because was exposed by someone else). 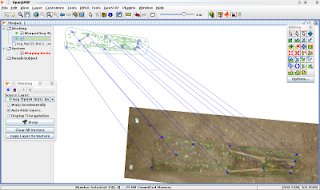 In other words, photomapping techniques and GIS allow also normal archaeologists to reach the same quality level of professionals in drawing layers or finds. 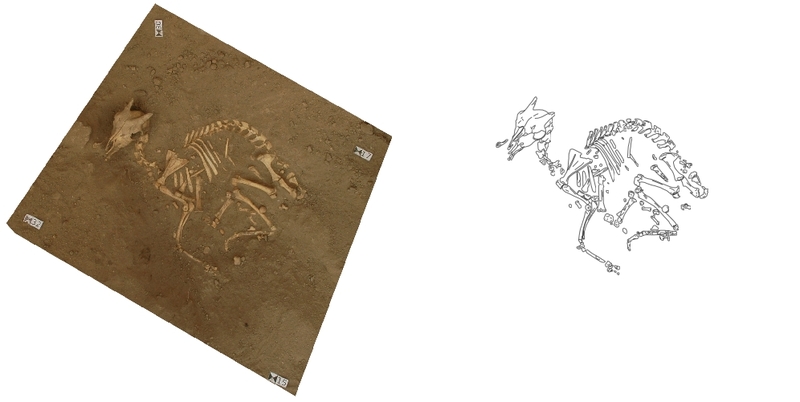 As an example, the picture below shows the skeleton of a young goat found in Aramus (AM): the georeferenced photomosaic is done with photomapping techniques ("metodo Aramus") and the drawing is done by me (i am not a professional in drawing) using the GIS OpenJUMP (inside ArcheOS). According to Pierre Moulon's Blog a new implementation (from Nghia Ho) has been integrated in CMVS-PMVS. The result should be a faster (up to 30%) data elaboration. We will start with the test as soon as possible and, in case, a new ArcheOS package for PPT (Python Photogrammetry Toolbox) and PPT-GUI will be released. For who wants to collaborate in PPT-GUI development, here is the link on GitHub. In the video below are some archaeological examples done with this software. 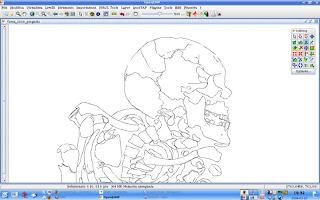 In 2009 we were looking for a system to get a fast and easy way to draw a lot of archaeological finds automatically. Thanks to the help of Simone Cavalieri (who found in internet Adrian Secord's algorythm) we developed a methodology which, combining different Free/Libre and Open Source Software, has speeded up our drawing techniques. The main point of the problem was to get an automatic shading through dots, to respect most rules in archaeological drawing. The solution was the software Stippler, which gave us promising results. 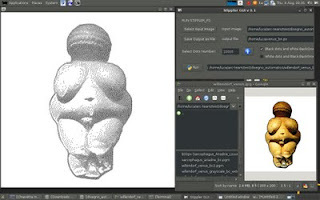 In the image below you can see just an example of automatic shading with a test low quality picture of the Venus of Willendorf (downloaded from Wikipedia). "Proposta per un metodo informatizzato di disegno archeologico" (here in ResearchGate and here in Academia).